Happy New Years Eve everyone! Fortunately, I am working from home this week. With this schedule, it gave me some extra time to bake up something healthy and delicious. 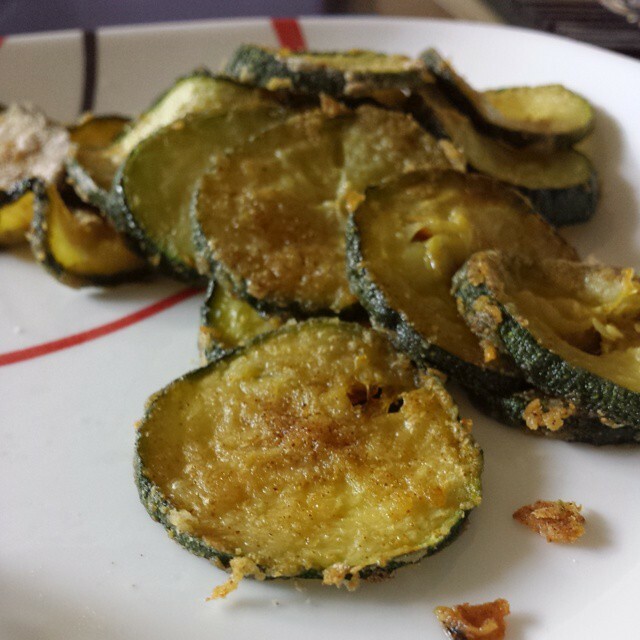 For today, my snack of choice was baked zucchini chips. I found this recipe in my new cookbook called Thug Kitchen. If you haven’t checked out their recipes, you totally should. They base their selections around whole foods rather than processed meat alternatives. That is something that I have been working on myself too. In fact, I am down 10lbs by just focusing on whole foods rather than vegan or vegetarian meal ideas. Step 1 Preheat the oven to 350 degrees. Using the cooking spray, coat a large baking sheet. Step 2 Cut the zucchini into coins about a quarter thick. Be careful cutting it too thin because they can burn easier. If the zucchini slices release any liquid, use a paper towel and dry them off. Step 3 Mix the seasonings (flour, paprika, garlic powder, and salt) in a medium bowl. Toss the zucchini in the medium bowl with the seasonings. Mix it until all the zucchini looks like it is evenly coated. Step 4 Lay the zucchini on the baking sheet. Slightly coat the vegetable with the cooking spray. Bake it for 30 to 40 minutes. Every 10 minutes, turn the zucchini. Once they are golden and crispy, they are ready to serve! This recipe makes about 30 chips.